Ships: Avalon has 23 ships, and none date back before 2008. Routes: In Europe, you can sail the Danube, Rhine, Main, Moselle, Seine, and Rhône rivers. U.S. cruises sail the Mississippi River. In South America, you can cruise the Amazon River or around the Galapagos Islands. And Asia routes sail the Yangtze, Mekong, and Irrawaddy rivers. Those who want to see a region without renting a car and schlepping their own bags from hotel to hotel, as well as those looking for a comfortable, casual way to explore with plenty of hand-holding. Those who’d rather make their own plans and determine every aspect of what they see on their vacation or for those who have the freedom to change their route at whim. 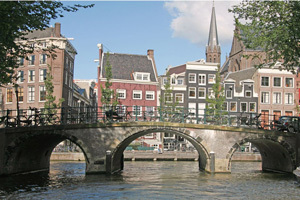 One of Amsterdam's 1,281 bridges. The line’s Avalon Choice® program gives passengers more control over their vacation plans than they get on most other lines by offering the option of setting up custom tours in advance. Unlike on many river cruise lines, the European ships in this fleet have small gyms and small beauty salons onboard. European ships also have a hot tub on deck and serve a grilled lunch on some afternoons, which is a lovely way to take in the scenery on, say, the Danube. Newer ships have two serve-yourself espresso machines, so you can treat yourself to a jet lag-fighting cappuccino whenever you need one. Cabins are modern and sleek, with marble bathrooms and down-filled duvets. No need to fight for a space on deck when you’re sailing past castles or into, say, Budapest: Newer ships have a whole wall of windows, which open up to let in fresh air and make you feel closer to the scenery. The complimentary Wi-Fi is, like on similar lines, slow and unreliable. Large group walking tours are led by guides with colored signs who speak into microphones. Passengers listen through headsets, which, while efficient and considerate of other travelers, don’t diminish the feeling of being herded through a city. Whether or not you’re bothered by this depends on how comfortable you are traveling in a group. While complimentary, these tours don’t always allow time for ample independent exploration. Avalon Choice is a registered trademark of Avalon Waterways Inc.
River vs. Ocean Cruises: Smackdown! There are currently 0 discussions about Avalon Waterways. If you choose to follow Avalon Waterways you will receive weekly email updates with the latest reviews, tips, and photos from Cruiseline.com members about Avalon Waterways.